Arlington National Cemetery is a United States military cemetery in Arlington County, Virginia, across the Potomac River from Washington, D.C., in whose 624 acres (252.5 ha) the dead of the nation's conflicts have been buried, beginning with the Civil War, as well as reinterred dead from earlier wars. The United States Department of the Army, a component of the United States Department of Defense (DoD), controls the cemetery. The national cemetery was established during the Civil War on the grounds of Arlington House, which had been the estate of Confederate general Robert E. Lee's wife Mary Anna (Custis) Lee (a great-granddaughter of Martha Washington). The Cemetery, along with Arlington House, Memorial Drive, the Hemicycle, and the Arlington Memorial Bridge, form the Arlington National Cemetery Historic District, listed on the National Register of Historic Places in April 2014. Like some other federal installations in Arlington County, it has a Washington, D.C. mailing address. In recent years, the Department of the Army has expanded the cemetery onto public lands and restricted bicycle use within the cemetery. Some of these actions have been controversial. George Washington Parke Custis, grandson of Martha Washington and adopted son of George Washington, acquired the land that now is Arlington National Cemetery in 1802, and began construction of Arlington House, which was ultimately named after the village of Arlington, Gloucestershire, England, where his family was originally from. The estate passed to Custis' daughter, Mary Anna, who had married United States Army officer Robert E. Lee. Custis' will gave a "life inheritance" to Mary Lee, allowing her to live at and run Arlington Estate for the rest of her life but not enabling her to sell any portion of it. Upon her death, the Arlington estate passed to her eldest son, George Washington Custis Lee. When Virginia seceded from the Union after the start of the American Civil War at Fort Sumter, Robert E. Lee resigned his commission on April 20, 1861, and took command of the armed forces of the Commonwealth of Virginia, later becoming commander of the Army of Northern Virginia. On May 7, troops of the Virginia militia occupied Arlington and Arlington House. With Confederate forces occupying Arlington's high ground, the capital of the Union was left in an untenable military position. Although unwilling to leave Arlington House, Mary Lee believed her estate would soon be recaptured by federal soldiers. So she buried many of her family treasures on the grounds and left for her sister's estate at Ravensworth in Fairfax County, Virginia, on May 14. On May 3, General Winfield Scott ordered Brigadier General Irvin McDowell to clear Arlington and the city of Alexandria, Virginia, of all troops not loyal to the United States. McDowell occupied Arlington without opposition on May 24. At the outbreak of the Civil War, most military personnel who died in battle near Washington, D.C., were buried at the United States Soldiers' Cemetery in Washington, D.C., or Alexandria Cemetery in Alexandria, Virginia, but by late 1863 both were nearly full. On July 16, 1862, Congress passed legislation authorizing the U.S. federal government to purchase land for national cemeteries for military dead, and put the U.S. Army Quartermaster General in charge of this program. In May 1864, Union forces suffered large numbers of dead in the Battle of the Wilderness. Quartermaster General Montgomery C. Meigs ordered that an examination of eligible sites be made for the establishment for a large new national military cemetery. Within weeks, his staff reported that Arlington Estate was the most suitable property in the area. The property was high and free from floods (which might unearth graves), it had a view of the District of Columbia, and it was aesthetically pleasing. It was also the home of the leader of the armed forces of the Confederate States of America, and denying Robert E. Lee use of his home after the war was a valuable political consideration. The first military burial at Arlington, for William Henry Christman, was made on May 13, 1864, close to what is now the northeast gate in Section 27. However, Meigs did not formally authorize establishment of burials until June 15, 1864. Arlington did not desegregate its burial practices until President Harry S. Truman issued Executive Order 9981 on July 26, 1948. The government acquired Arlington at a tax sale in 1864 for $26,800, equal to $400,000 today. Mrs. Lee had not appeared in person but rather had sent an agent, attempting to pay the $92.07 in property taxes (equal to $1,400 today) assessed on the estate in a timely manner. The government turned away her agent, refusing to accept the tendered payment. In 1874, Custis Lee, heir under his grandfather's will passing the estate in trust to his mother, sued the United States claiming ownership of Arlington. On December 9, 1882, the U.S. Supreme Court ruled 5–4 in Lee's favor in United States v. Lee, deciding that Arlington had been confiscated without due process. After that decision, Congress returned the estate to him, and on March 3, 1883, Custis Lee sold it back to the government for $150,000 (equal to $3,174,545 in 2019) at a signing ceremony with Secretary of War Robert Todd Lincoln. The land then became a military reservation. President Herbert Hoover conducted the first national Memorial Day ceremony in Arlington National Cemetery, on May 30, 1929. Beginning in 1863, the federal government used the southern portion of the land now occupied by the cemetery as a settlement for freed slaves, giving the name of "Freedmen's Village" to the land. The government constructed rental houses that 1,100 to 3,000 freed slaves eventually occupied while farming 1,100 acres (450 ha) of the estate and receiving schooling and occupational training during the Civil War and after War ended. However, after the land became part of a military reservation, the government asked the Villagers to leave. When some remained, John A. Commerford, the Superintendent of Arlington National Cemetery, asked the Army's Quartermaster General in 1887 to close the Village on the grounds that people living in the Village had been taking trees at night from the cemetery for use as firewood. The Quartermaster General and the Secretary of War then approved Commerford's request. The last of the Village's residents departed after the 56th United States Congress appropriated $75,000 in 1900 to settle the government's debts to them. With limited space but large numbers of World War II, Korean War, Vietnam War, and other veterans dying and wanting to be buried at Arlington, the need for additional burial space at the cemetery became a pressing issue. In 1991, Cemetery superintendent John C. Metzler, Jr., implemented a $1.4 million plan to clear a former 13-acre (5.3 ha) parking lot to create space for about 9,000 new grave sites. The Cemetery received the authority to transfer 12 acres (4.9 ha) of woodland from the NPS-controlled Arlington House in 1996 and 2001, 37 acres (15.0 ha) of land in 1999 from the DoD that was the site of the Navy Annex building, 8 acres (3.2 ha) of land in 1999 from the Department of the Army that was part of Fort Myer, 4 acres (1.6 ha) of land from Arlington County's Southgate Road right-of-way in 2004, and just under 10 acres (4.0 ha) of land from Fort Myer in 2005. Gravestones at Arlington National Cemetery are marked by U.S. flags each Memorial Day. In 2007, Metzler implemented the Millennium Project, a $35 million expansion plan to begin utilizing the Arlington woodland, Fort Myer, and Navy Annex land. The project also included converting 40 acres (16 ha) of unused space and 4 acres (16,000 m2) of maintenance property on the cemetery grounds into burial space in 2006 and 2007 to allow an additional 26,000 graves and 5,000 inurnments. The Millennium Project expanded the cemetery's physical boundaries for the first time since the 1960s, and was the largest expansion of burial space at the site since the American Civil War. Several environmental and historical preservation groups criticized Metzler's plans, as did the NPS and the manager of Arlington House. On March 26, 2013, the Consolidated and Further Continuing Appropriations Act, 2013 (Public Law 113-6) appropriated to the DoD $84 million to plan, design and construct the Millennium Project. The legislation additionally appropriated to the DoD $19 million to study, plan and design a future expansion of the cemetery's burial space. In 1998, a Congressional proposal to expand the cemetery onto land that the Navy Annex and Fort Myer then occupied led to concerns that Arlington County officials had not been properly consulted, leading to the withdrawal of the proposal. However, the National Defense Authorization Act for Fiscal Year 2000 (Public Law 106-65), which was enacted into law during October 1999, subsequently required the Secretary of Defense to transfer to the Secretary of the Army administrative jurisdiction of the 36 acres (14.6 ha) Navy Annex property. The Act required the Secretary of Defense to demolish the Annex's buildings and prepare the property for use as part of the cemetery, while requiring the Secretary of the Army to incorporate the Annex property into the cemetery. The Army would also transfer land west of South Joyce Street to Columbia Pike to Arlington County. Additionally, the Commonwealth of Virginia would convey to the cemetery roughly the northern half of the Virginia Department of Transportation land bounded by South Joyce Street, Columbia Pike, and South Washington Boulevard. The cloverleaf interchange between Columbia Pike and S. Washington Blvd. would be eliminated, and the hairpin turn in Columbia Pike straightened, to provide a safer, more natural exit from S. Washington Blvd. onto Columbia Pike. Although exact acreages were not specified and the plan depended upon the Commonwealth of Virginia's cooperation, the MOU if implemented would have created a more contiguous plot of land for the cemetery. On February 22, 1995, officials of the United States Department of the Interior and the United States Department of the Army signed an agreement to transfer from Arlington House, The Robert E. Lee Memorial, to the Army a part of Arlington Woods, which was located in Section 29 of the NPS at Arlington National Cemetery between Arlington House and Fort Myer. The property transfer, which involved 12 acres (4.9 ha) of NPS land, was intended to permit Metzler to start expanding the cemetery beyond its existing boundaries. Environmentalists expressed concerns that the agreement would result in the partial destruction of the 24-acre (9.7 ha) remnant of a historically important stand of native trees. A historical marker near the woodland notes that, while visiting Arlington House in 1825, Gilbert du Motier, Marquis de Lafayette had warned Mary Lee Fitzhugh Custis, the wife of George Washington Parke Custis: "Cherish these forest trees around your mansion. Recollect how much easier it is to cut a tree than to make one grow." The marker further notes that the Virginia Native Plant Society had recognized the woodland as being one of the best examples of old growth terraced gravel forest remaining in Virginia. On September 23, 1996, the National Defense Authorization Act for Fiscal Year 1997 (Public Law 104-201) authorized the Secretary of the Interior to transfer to the Secretary of the Army all of the land in Section 29 that was within an "Arlington National Cemetery Interment Zone" and some of the land in the Section that was within a "Robert E. Lee Memorial Preservation Zone". On March 5, 1998, the NPS, which is a component of the Department of the Interior, informed the National Capital Planning Commission that it wanted to transfer only 4 acres (1.6 ha) to the cemetery, rather than the 12 acres (4.9 ha) that the 1995 agreement had described. In response, Metzler stated: "I was surprised. But we will continue to work with the Department of Interior and see what happens." On July 12, 1999, the NPS issued a Federal Register notice that announced the availability of an environmental assessment (EA) for the transfer. The EA stated that the Interment Zone contained the oldest and largest tract of climax eastern hardwood forest in Arlington County. This forest was the same type that once covered the Arlington estate, and had regenerated from trees that were present historically. A forestry study determined that a representative tree was 258 years old. The Interment Zone was also determined to contain significant archeological and cultural landscape resources, in addition to those in the Preservation Zone. The EA described four alternative courses of action. In contrast to the NPS's March 1998 statement to the National Capital Planning Commission, the 1999 EA stated that the preferred alternative (Alternative 1) would transfer to the cemetery approximately 9.6 acres (3.88 ha), comprising most of the Interment Zone and the northern tip of the Preservation Zone. Another alternative (Alternative 3) would transfer to the cemetery the 12 acres (4.9 ha) Interment Zone, while keeping the 12.5 acres (5.06 ha) Preservation Zone under NPS jurisdiction. The EA concluded: "Public Law 104-201 directed the Secretary of the Interior to transfer to the Secretary of the Army jurisdiction over the Interment Zone, which is the plan in Alternative 3. Adoption of any of the other alternatives would require legislative action to amend the existing law." Map showing the Millennium Project's expansion of Arlington National Cemetery into Arlington Woods and Fort Myer. On December 28, 2001, the National Defense Authorization Act for Fiscal Year 2002 (Public Law 107-107) repealed the "obsolete" part of Public Law 104-201 that had authorized the transfer of portions of Section 29 to the Secretary of the Army. The new legislation required the Secretary of the Interior to transfer to the Secretary of the Army within 30 days the approximately 12 acres (4.9 ha) Interment Zone. The transfer therefore involved the entire 12 acres (4.9 ha) of NPS land that the 1995 agreement and Alternative 3 in the 1999 EA had described. The 2001 legislation required the Secretary of the Army to use the Interment Zone for in-ground burial sites and columbarium. In addition, the legislation required the Secretary of the Interior to manage the remainder of Section 29 "in perpetuity to provide a natural setting and visual buffer for Arlington House, the Robert E. Lee Memorial." On December 12, 2012, the United States Army Corps of Engineers asked for comments on a draft EA that described a further expansion of Arlington National Cemetery as part of the Millennium Project. The 2012 draft EA was intended to implement conversion into burial space of the 17 acres (6.9 ha) of Ft. Myer grounds as well as 10 acres (4.0 ha) of Section 29 woodland. The draft EA described seven alternatives. The preferred alternative (Alternative E) called for the removal of about one-half of the 1,700 trees with a diameter of 6 inches (15 cm) or greater on the site. About 640 of the trees were within a 135-year-old portion of Arlington Woods. The draft EA concluded: "Based on the evaluation of environmental impacts....., no significant impacts would be expected from the Proposed Action; therefore, an Environmental Impact Statement will not be prepared and a Finding of No Significant Impact will be prepared and signed." On March 12, 2013, the Corps of Engineers released a revised EA for the Millennium Project. The revised EA contained copies of a number of public comments on the draft EA that had criticized the project and parts of the EA while proposing alternative locations for new military burials near the cemetery and elsewhere. However, the Department of Forestry of the Commonwealth of Virginia found that, based on information in the draft EA, the project would not have a significant adverse impact on the Commonwealth's forest resources. The revised EA did not change the preferred alternative (Alternative E) or the Army's plans to prepare and sign the Finding of No Significant Impact (FONSI) that the draft EA had described. On June 5, 2013, after reviewing 100 public comments that it had received on the revised EA, the Corps of Engineers released a final EA and a signed FONSI for the Millennium Project. The Final EA and the FONSI retained Alternative E as the preferred alternative. The final EA stated that, of the 905 trees to be removed, 771 trees were healthy native trees that had diameters between 6 and 41 inches. The project would remove approximately 211 trees from a less than 2.63 acres (1.064 ha) area containing a portion of a 145-year-old forest that stood within the property boundaries of a historic district that a National Register of Historic Places nomination form for Arlington House had described in 1966. About 491 trees would be removed from an area of trees that was approximately 105 years old. Approximately 203 trees with ages of 50 to 145 years would be removed from a former picnic area. At a public hearing on July 11, 2013, the National Capital Planning Commission approved the site and building plans for the Millennium Project. On June 9, 2010, United States Secretary of the Army John M. McHugh reprimanded the cemetery's superintendent, John C. Metzler, Jr., and his deputy, Thurman Higgenbotham, after a DOD inspector general's report revealed that cemetery officials had placed the wrong headstones on tombs, buried coffins in shallow graves, and buried bodies on top of one another. Metzler, who had already announced his intention to retire on July 2, 2010, admitted some mistakes had been made but denied allegations of widespread or serious mismanagement. The investigation also found that cemetery employees were burdened in their day-to-day work by "dysfunctional management, lack of established policy and procedures, and an overall unhealthy organizational climate." Both Metzler and Higgenbotham retired soon after the investigation commenced. In March 2011, as a result of the problems discovered, Kathryn Condon, the recently appointed Executive Director of the Army National Military Cemeteries, announced that the cemetery's staff had been increased from 102 to 159. She added that the cemetery was also acquiring additional equipment because, "They didn't have the proper equipment to do the job really to the standard they needed to do." The mismanagement controversy included a limitation on mass media access to funerals, which also proved controversial. Until 2005, the cemetery's administration gave free access, with the family's permission, to the press to cover funerals at the cemetery. According to the Washington Post in 2008, the cemetery gradually imposed increasing restrictions on media coverage of funerals beginning about 2005. After the cemetery's management controversy began to end, the Army appointed Patrick K. Hallinan the acting superintendent of the cemetery in June 2010. He was promoted permanently to the position in October 2010. Hallinan had previously worked for the Office of Field Programs in the National Cemetery Administration, an agency of the United States Department of Veterans' Affairs. In that capacity, Hallinan had oversight of 131 national cemeteries, national cemetery policy, procedures, and operations. Hallinan was promoted to Executive Director of the Army National Military Cemeteries upon the retirement of Kathryn Condon in spring 2014. In May 2014, Hallinan stepped down and was replaced by Jack E. Lechner, Jr. as superintendent of the cemetery. Lechner had been a funeral director for 10 years in the private sector before joining the U.S. Army. He rose to the rank of colonel (retiring in November 2011), having spent 2008 to 2010 as chief of the Supply Division of the Joint Chiefs of Staff, overseeing the equipping of Iraqi and Afghanistan national security forces. Since June 2010, he had served as executive officer and deputy superintendent of the cemetery under Hallinan. The Army removed Lechner as superintendent of the cemetery in early August 2015 after a performance review "called into question his ability to serve successfully as a senior leader". The Army declined to elaborate further and appointed Hallinan to be the temporary Cemetery superintendent until the Army could find a successor. Beginning in 1992, the Morrill Worcester wreath company in Harrington, Maine, had a surplus at the end of the holiday season. Recalling a boyhood trip to the cemetery, Worcester donated to the cemetery 5,000 wreaths to honor the cemetery's dead, with the help of volunteers and a local trucking company. After thirteen years of similar donations, in 2005 a photo of snowy gravestones covered with wreaths at the cemetery received widespread circulation on the Internet. Thousands of people called Worcester, wanting to replicate the wreath-laying service at their own veteran cemeteries. In 2006, over 150 different locations simultaneously held ceremonies with Arlington's. Additionally, the project had its first "Veterans Honor Parade" with "Patriot Guard Riders" who escorted the wreaths from Maine to the cemetery. The parade, which is held each year, now visits schools, monuments, veterans' homes and communities along its route. At the end of 2006, Worcester's company supplied wreaths to over 230 state and national cemeteries and veterans monuments across the country. Assisted by veterans and truckers, Worcester established in 2007 a nonprofit organization named "Wreaths Across America". In December 2008, the United States Senate agreed to a resolution that designated December 13, 2008, as "Wreaths Across America Day". In 2014, volunteers placed over 700,000 memorial wreaths at 1,000 locations in the United States and overseas, including the USS Arizona Memorial at Pearl Harbor, Bunker Hill, Valley Forge, and the National September 11 Memorial at the World Trade Center site in New York City. During that year, volunteers were able to place wreaths in all sections of the cemetery for the first time. In 2016, this number increased to 1.2 million wreaths being placed at more than 1,230 cemeteries across the nation. Conflict of interest charges have been made against Wreaths Across America because this charity has an exclusive for-profit supplier, Worcestor Wreath Company, also run by the Morrill family in the same town. The charity's purchases of wreaths from this company account for most of the company's revenue and profits. In late 2015, the Wall Street Journal reported serious conflicts of interest with potential malfeasance in governance and contracting. In 2015 alone the WSJ reported profits of over $1 million on sales of over 850,000 wreaths to the charity raising concerns about competitive bidding, reporting that several competitors had asked to bid significantly below the price offered by Worcestor Wreath Company but were denied access. During May and June 2014, the cemetery celebrated the 150th anniversary of its founding with a month-long series of events, tours, and lectures. During these celebrations, cemetery officials formally re-designated the Old Amphitheater as the James Tanner Amphitheater. James R. Tanner was a Union Army officer who lost both legs during the war. He later became a War Department stenographer, and recorded much of the early evidence in the investigation into the assassination of Abraham Lincoln. He later was active in the Grand Army of the Republic, a Union Army veterans group. Tanner is buried a few yards from the amphitheater. The Cemetery is divided into 70 sections, with some sections in the southeast and western part of the cemetery reserved for future expansion. Section 60, in the southeast part of the cemetery, is the burial ground for military personnel killed in the Global War on Terror since 2001. Section 21, also known as the Nurses Section, is the area of Arlington National Cemetery where many nurses are buried and is the site of the Spanish–American War Nurses Memorial and the Nurses Memorial. Another section—Chaplains Hill—includes monuments to Jewish, Protestant, and Roman Catholic military chaplains. In 1901, Confederate soldiers buried at the Soldiers' Home and various locations within Arlington were reinterred in a Confederate section that was authorized by Congress in 1900. On June 4, 1914, the United Daughters of the Confederacy dedicated the Confederate Memorial designed by Moses Ezekiel. Upon his death in 1917, Ezekiel was buried at the base of the monument as he was a veteran of the Confederate army. All Confederate headstones in this section are peaked rather than rounded. More than 3,800 former slaves, called "Contrabands" during the Civil War, are buried in Section 27. Their headstones are designated with the word "Civilian" or "Citizen". The United States Department of Veterans Affairs oversees the National Cemetery Administration's orders for placement of inscriptions and faith emblems at no charge to the estate of the deceased, submitted with information provided by the next of kin that is placed on upright marble headstones or columbarium niche covers. The Department of Veterans Affairs currently offers 63 authorized faith emblems for placement on markers to represent the deceased's faith. This number has grown in recent years due to legal challenges to policy. Prior to 2007, the United States Department of Veterans Affairs (VA) did not allow the use of the pentacle as an "emblem of belief" on tombstones in military cemeteries. This policy was changed following an out-of-court settlement on April 23 following a series of lawsuits by the family of Patrick Stewart against the VA. Between 1947 and 2001, privately purchased markers were permitted in the cemetery. The sections in which the cemetery permitted such markers are nearly filled and the cemetery generally does not allow new burials in these sections. Nevertheless, the older sections of the cemetery have a wide variety of private markers placed prior to 2001, including an artillery piece. There are 32 Commonwealth war dead burials and some headstones are Commonwealth War Graves Commission style. The Tomb of the Unknowns is part of the Arlington Memorial Amphitheater. The Memorial Amphitheater has hosted state funerals and Memorial Day and Veterans Day ceremonies. Ceremonies are also held for Easter. About 5,000 people attend these holiday ceremonies each year. The structure is mostly built of Imperial Danby marble from Vermont. The Memorial Display room, between the amphitheater and the Tomb of the Unknowns, uses Botticino stone, imported from Italy. The amphitheater was the result of a campaign by Ivory Kimball to construct a place to honor America's servicemen/women. Congress authorized the structure on March 4, 1913. Woodrow Wilson laid the cornerstone for the building on October 15, 1915. The cornerstone contained 15 items including a Bible and a copy of the Constitution. Before the Arlington Memorial Amphitheater was completed in 1921, important ceremonies were held at what is now known as the "Old Amphitheater." This structure sits where Robert E. Lee once had his gardens. The amphitheater was built in 1868 under the direction of Civil War General John A. Logan. Gen. James A. Garfield was the featured speaker at the Decoration Day dedication ceremony, May 30, 1868, later being elected as President of the United States 1881. The amphitheater has an encircling colonnade with a latticed roof that once supported a web of vines. The amphitheater has a marble dais, known as "the rostrum", which is inscribed with the U.S. national motto found on the Great Seal of the United States, E pluribus unum ("Out of many, one"). The rostrum was designed by General Montgomery C. Meigs, then Quartermaster General of the U.S. Army. The amphitheater seats 1,500 people and has hosted speakers such as William Jennings Bryan. The Tomb of the Unknown Soldier stands on top of a hill overlooking Washington, D.C. One of the more well-attended sites at the cemetery, the tomb is made from Yule marble quarried in Colorado. It consists of seven pieces, with a total weight of 79 short tons (72 metric tons). The tomb was completed and opened to the public April 9, 1932, at a cost of $48,000. Unknown Soldier of the Vietnam War, interred May 28, 1984; President Ronald Reagan presided. The remains of the Vietnam Unknown were disinterred, under the authority of President Bill Clinton, on May 14, 1998, and were identified as those of Air Force 1st Lt. Michael J. Blassie, whose family had them reinterred near their home in St. Louis, Missouri. It has been determined that the crypt at the Tomb of the Unknowns that contained the remains of the Vietnam Unknown will remain empty. After each turn, the Guard executes a sharp "shoulder-arms" movement to place the weapon on the shoulder closest to the visitors to signify that the Guard stands between the Tomb and any possible threat. Twenty-one was chosen because it symbolizes the highest military honor that can be bestowed—the 21-gun salute. Each turn the guard makes precise movements and followed by a loud click of the heels as he snaps them together. The guard is changed every half-hour during daylight in the summer, and every hour during daylight in the winter and every two hours at night (when the cemetery is closed to the public), regardless of weather conditions. A commemorative stamp was issued on November 11, 1922, the first anniversary of the first entombment picturing the Amphitheater. It encompasses the original Tomb of the Unknown Soldier. The remains of an unidentified WW I American soldier was entombed on Armistice Day, November 11, 1921, later covered in 1931 by a more elaborate marble sarcophagus. There are several memorials on the grounds of the cemetery. However, due to the lack of space for burials and the large amount of space that memorials take up, the U.S. Army now requires a joint or concurrent resolution from Congress before it will place new memorials at Arlington. Near the Tomb of the Unknowns stands the USS Maine Mast Memorial, which commemorates the 266 men who lost their lives aboard the USS Maine. The memorial is built around a mast salvaged from the Maine's wreckage. The USS Maine Memorial served as the temporary resting place for foreign heads of state or government, Manuel L. Quezon of the Philippines and Ignacy Jan Paderewski of Poland, who died in exile in the United States during World War II. The Space Shuttle Challenger Memorial was dedicated on May 20, 1986, in memory of the crew of flight STS-51-L, who died during launch on January 28, 1986. Transcribed on the back of the stone is the text of the John Gillespie Magee, Jr. poem High Flight, which was quoted by then President Ronald Reagan when he addressed the disaster. Although many remains were identified and returned to the families for private burial, some were not, and were laid to rest under the marker. Two crew members, Scobee and Smith, are buried in Arlington. On February 1, 2004, NASA Administrator Sean O'Keefe dedicated a similar memorial to those who died when the Shuttle Columbia broke apart during reentry on February 1, 2003. Astronauts Laurel Clark, David Brown and Michael Anderson, who were killed in the Columbia disaster, are also buried in Arlington. The Lockerbie Cairn is a memorial to the 270 killed in the bombing of Pan Am Flight 103 over Lockerbie, Scotland. The memorial is constructed of 270 stones, one for each person killed in the disaster. In section 64, a memorial to the 184 victims of the September 11 attacks on the Pentagon was dedicated September 11, 2001. The memorial takes the shape of a pentagon, and lists the names of all the victims that were killed. Unidentified remains from the victims are buried beneath it. On June 25, 1925, President Calvin Coolidge approved a request to erect a Commonwealth Cross of Sacrifice with the names of all the citizens of the USA who lost their lives fighting in the Canadian forces during World War I. The monument was dedicated November 11, 1927 and after the Korean War and World War II the names of US citizens who died in those conflicts were added. The Women in Military Service for America Memorial is adjacent to the Ceremonial Entrance to the cemetery. The Laos Memorial, or Lao Veterans of America memorial, dedicated to Lao and Hmong veterans who served with US Special Forces and CIA advisors during the Vietnam War, to defend the Royal Kingdom of Laos from the North Vietnamese invasion of Laos by selling opium to the CIA in exchange for weapons and promises for their own country, is located on Grant Avenue near the eternal flame memorial to U.S. President John F. Kennedy. In 2012, legislation began moving through Congress to approve a "Place of Remembrance" at the cemetery. The memorial will be an ossuary designed to contain fragments of remains which are unidentifiable through DNA analysis. The remains will be cremated before placement in the memorial. Arlington House flag flying at half-staff. The flag is lowered during interments. The flags in the cemetery are flown at half-staff from a half-hour before the first funeral until a half hour after the last funeral each day. Funerals are normally conducted five days a week, excluding weekends. Funerals, including interments and inurnments, average between 27–30 per day. The Cemetery conducts approximately 6,900 burials each year. With more than 400,000 interments, the cemetery has the second-largest number of burials of any national cemetery in the United States. The largest of the 130 national cemeteries is the Calverton National Cemetery, on Long Island, near Riverhead, New York, which conducts more than 7,000 burials each year. In addition to in-ground burial, the cemetery also has one of the larger columbaria for cremated remains in the country. Four courts are currently in use, each with 5,000 niches. When construction is complete, there will be nine courts with a total of 50,000 niches; capacity for 100,000 remains. Any honorably discharged veteran is eligible for inurnment in the columbarium, if s/he served on active duty at some point in her/his career (other than for training). Part 553 (Army National Military Cemeteries) of Title 32 of the Code of Federal Regulations (CFR) establishes regulations for the cemetery, including eligibility for interment (ground burial) and inurnment. Due to limited space, the criteria for ground burial eligibility are more restrictive than at other national cemeteries, as well as more restrictive than for inurnment in the columbarium. The persons specified below are eligible for ground burial in the cemetery, unless otherwise prohibited. The last period of active duty of former members of the armed forces must have ended honorably. Interment may be of casketed or cremated remains. Respectful silence is requested at the Arlington National Cemetery. Due at least partly to the lack of space at the cemetery for ground burial, standards for inurnment (burial of cremated remains) in the columbarium are currently much less restrictive than for ground burial at the cemetery. In general, any former member of the armed forces who served on active duty (other than for training) and whose last service terminated honorably is eligible for inurnment. Eligibility for inurnment is described fully in 32 C.F.R. § 553.15a. Congress has from time to time created prohibited categories of persons that, even if otherwise eligible for burial, lose that eligibility. One such prohibition is against certain persons who are convicted of committing certain state or federal capital crimes, as defined in 38 U.S. Code § 2411. Capital crime is a specifically defined term in the statute, and for state offenses can include offenses that are eligible for a life sentence (with or without parole). The reasoning for this provision originally was to prevent Timothy McVeigh from being eligible at Arlington National Cemetery, but it has since been amended to prevent others. Also prohibited under the same statute are those determined, with clear and convincing evidence, to have avoided such conviction by death or flight. The first soldier to be buried in Arlington was Private William Henry Christman of Pennsylvania on May 13, 1864. There are 396 Medal of Honor recipients buried in Arlington National Cemetery, nine of whom are Canadian. Five state funerals have been held at Arlington: those of Presidents William Howard Taft and John F. Kennedy, his two brothers, Senator Robert F. Kennedy and Senator Edward "Ted" Kennedy, and General of the Armies John J. Pershing. Whether or not they were wartime service members, U.S. presidents are eligible to be buried at Arlington, since they oversaw the armed forces as commanders-in-chief. Among the most frequently visited sites in the cemetery is the grave of President John F. Kennedy, Jacqueline Kennedy Onassis who is buried nearby along with their son Patrick and their stillborn daughter Arabella. His remains were interred there on March 14, 1967, a reinterment from his original Arlington burial site, some 20 feet (6.1 m) away, where he was buried in November 1963. The grave is marked with an "eternal flame". The remains of his brothers, Senator Robert F. Kennedy and Senator Edward M. "Ted" Kennedy, are buried nearby. The latter two graves are marked with simple crosses and footstones. On December 1, 1971, Robert Kennedy's body was re-interred 100 feet (30 m) from its original June 1968 burial site. Two of the astronauts who were killed in January 27, 1967 flash fire inside the Apollo 1 Command Module, Gus Grissom and Roger Chaffee, are buried at the cemetery. John Glenn, the first American to orbit Earth and a longtime U.S. Senator from Ohio, was buried at the cemetery in April 2017. British Diplomat and Field Marshal Sir John Dill was buried at the cemetery when he died in Washington D.C. during World War II. The equestrian statue on Dill's grave is one of only two such statues at the cemetery; the other is Major General Philip Kearny's. The cemetery has within recent years announced policies and procedures that limit visitor access to the cemetery's grounds. The Cemetery's executive director has stated that some of these may create delays for visitors. Some have become controversial. On August 6, 2013, Patrick Hallinan, Executive Director, Army National Military Cemeteries, issued an official memorandum that contained the cemetery's then-current bicycle use policy. The memorandum permitted cyclists to travel in only one direction on only one route unless otherwise authorized by the executive director. This "White Line" route traveled from the Old Post Chapel gate at Joint Base Myer–Henderson Hall towards the main entrance of the cemetery at Memorial Avenue, using Meigs Drive, Sherman Drive and Schley Drive. The memorandum stated without explanation: "Bicycle traffic will not be permitted to travel in the reverse direction." Cyclists could only use this route between 8:00 a.m. and 6:45 p.m. from April 1 to September 30 and between 8:00 a.m. and 4:45 p.m. from October 1 to March 31. Cyclists had to wear bicycle helmets that certain designated organizations had approved. Bicycles had to be equipped with headlights, tail lights or red reflectors in lieu of tail lights, regardless of the time of travel. On May 11, 2016, the Department of the Army published in the Federal Register a proposed rule that would, among other things, prohibit a visitor to an Army National Military Cemetery (Arlington National Cemetery and the United States Soldiers' and Airmen's Home National Cemetery) from riding a bicycle without first acquiring a pass to visit a relative's gravesite or columbarium niche. After receiving 13 comments from 13 individuals concerning the use of bicycles in the cemetery (including comments from representatives of the Arlington County Board and local bicycle advocacy groups that opposed the new restrictions), the Department of the Army published a final rule in the Federal Register on September 26, 2016, that implemented the proposed rule, effective October 26, 2016. In accordance with the final rule, the cemetery issued a new bicycle use policy, effective October 26, 2016. The policy stated that bicycling would no longer be allowed on Cemetery grounds without a family pass. The policy further stated that "bicyclists traversing the cemetery grounds do impact funeral services and the experience that families expect and deserve as they visit their loved one's grave. ... As there are no bike paths on the cemetery grounds, mixing cyclists with pedestrians and vehicles creates a safety hazard." In September 2016, Hallinan announced that the cemetery was increasing security measures for its visitors. In addition to random identification checks and other security measures already in place, the cemetery will require pedestrians to enter at set access points: the main entrance on Memorial Avenue, the Ord and Weitzel gate, and the Old Post Chapel gate at Joint Base Myer-Henderson Hall. Before entering the cemetery through its main entrance, all pedestrians will be screened through the cemetery's Welcome Center. All vehicle access will require presenting valid, government-issued photo identification, such as a driver's license or passport, when entering the cemetery. Vehicles will also be subject to random inspections. Hallinan stated that these processes may result in delays when entering the cemetery. Micki McElya, The Politics of Mourning: Death and Honor at Arlington National Cemetery. Cambridge, MA: Harvard University Press, 2016. ^ a b Davenport, Christian. "Arlington Cemetery Trying to Account for Missing $12 Million." Washington Post. January 25, 2012. ^ "Weekly list of actions take: 04//07/14 to 04/11/14". National Park Service. Archived from the original on April 25, 2014. http://www.nps.gov/history/nr/listings/20140418.htm. Retrieved April 22, 2014. ^ Smith, Adam; Tooker, Megan; Enscore, Susan, US Army Corps of Engineers, ERDC-CERL, Champaign, Illinois (January 31, 2013). "National Register of Historic Places Nomination Form: Arlington National Cemetery Historic District". National Park Service. Archived from the original on September 4, 2014. https://web.archive.org/web/20140904235704/http://www.nps.gov/nr/feature/places/pdfs/14000146.pdf. Retrieved March 29, 2015. ^ a b Hanna, Jennifer (2001). Arlington House, The Robert E. Lee Memorial. Washington DC: U. S. Department of the Interior. p. 62. Archived from the original on September 5, 2016. https://www.nps.gov/parkhistory/online_books/arho/clr.pdf. Retrieved October 18, 2016. ^ Ezra J. Warner (1959). Generals in Gray. Baton Rouge: Louisiana State University Press. p. 181. ISBN 978-0-8071-0823-9. ^ Hansen, 2001, p. 69. ^ Chase, 1930, p. 173. ^ McCaslin, 2004, p. 79-80. ^ Atkinson, 2007, p. 25. ^ Chase, 1930, p. 175-176. ^ Chase, 1930, p. 176. ^ a b c Hanna, Jennifer (2001). Arlington House, The Robert E. Lee Memorial. Washington DC: U. S. Department of the Interior. p. 84. Archived from the original on September 5, 2016. https://www.nps.gov/parkhistory/online_books/arho/clr.pdf. Retrieved October 18, 2016. ^ Hanna, Jennifer (2001). Arlington House, The Robert E. Lee Memorial. Washington DC: U. S. Department of the Interior. p. 88. Archived from the original on September 5, 2016. https://www.nps.gov/parkhistory/online_books/arho/clr.pdf. Retrieved October 18, 2016. ^ Hanna, Jennifer (2001). Arlington House, The Robert E. Lee Memorial. Washington DC: U. S. Department of the Interior. p. 86. Archived from the original on September 5, 2016. https://www.nps.gov/parkhistory/online_books/arho/clr.pdf. Retrieved October 18, 2016. ^ Dennee, p. 4. Script error Accessed July 9, 2012. ^ Hanna, Jennifer (2001). Arlington House, The Robert E. Lee Memorial. Washington DC: U. S. Department of the Interior. p. 85. Archived from the original on September 5, 2016. https://www.nps.gov/parkhistory/online_books/arho/clr.pdf. Retrieved October 18, 2016. ^ a b Hughes, Mark (1995). Bivouac of the Dead. Heritage Books. p. 265. ISBN 978-0-7884-0260-9. ^ a b "Historical Information". Arlington National Cemetery. Archived from the original on September 13, 2010. https://web.archive.org/web/20100913093837/http://www.arlingtoncemetery.org/historical_information/arlington_house.html. Retrieved July 29, 2011. United States v. Lee Kaufman. Wikisource. ^ a b "Arlington House, The Robert E. Lee Memorial". Arlington National Cemetery. Arlington, Virginia: United States Army. October 7, 2015. Archived from the original on January 17, 2016. https://web.archive.org/web/20160117100524/http://www.arlingtoncemetery.mil/Explore/History/Arlington-House. Retrieved September 28, 2016. ^ a b c d Schildt, Roberta (1984). "Freedmen's Village: Arlington, Virginia, 1863–1900". Arlington Historical Magazine 7: 18–19. Retrieved on September 28, 2016. At arlcivilwar.net: Arlington's Civil War Memorial Website. ^ John T. Wolley and Gerhard Peters. "Herbert Hoover: Memorial Day Address at Arlington National Cemetery". The American Presidency Project [online]. Archived from the original on November 16, 2008. http://www.presidency.ucsb.edu/ws/index.php?pid=22129. Retrieved May 26, 2010. ^ (1) Schildt, Roberta (1984). "Freedmen's Village: Arlington, Virginia, 1863–1900". Arlington Historical Magazine 7: 11–21. Retrieved on September 28, 2016. Script error. (2) "Freedman's Village". Arlington House, The Robert E. Lee Memorial. National Park Service: United States Department of the Interior. 2016. Archived from the original on July 14, 2016. https://web.archive.org/web/20160714094821/https://www.nps.gov/arho/learn/historyculture/emancipation.htm. Retrieved September 28, 2016. (3) "Black History at Arlington National Cemetery". Arlington National Cemetery. Arlington, Virginia: United States Army. Archived from the original on January 23, 2016. https://web.archive.org/web/20160123151016/http://www.arlingtoncemetery.mil/Explore/Notable-Graves/Minorities/Black-History-at-ANC. Retrieved September 28, 2016. ^ Letter from J.A. Commerford to G.B. Dandy, November 12, 1887, Consolidated Quartermaster General File. R.G. 105, cited as Footnote 66 in Schildt, p. 21. ^ Kaplow, Bobby (October 24, 1991). "Arlington National Cemetery Being Expanded". The Washington Post. p. VA2C. http://pqasb.pqarchiver.com/washingtonpost_historical/doc/140476371.html. Retrieved July 20, 2017. "Arlington National Cemetery is undergoing its first expansion since 1976, as work began in mid-August to clear a 13-acre tract to make space for about 9,000 new grave sites." ^ a b "Division B: Military Construction Authorization Act for Fiscal Year 1997: Title XXVIII—General Provisions: Subtitle C—Land Conveyances: Section 2821(a). Transfer of lands, Arlington National Cemetery, Arlington, Virginia (110 Stat. 2791–2792)" (pdf). Public Law 104-201: National Defense Authorization Act for Fiscal Year 1997. United States Government Printing Office. September 23, 1996. Archived from the original on November 4, 2012. http://www.gpo.gov/fdsys/pkg/PLAW-104publ201/pdf/PLAW-104publ201.pdf. Retrieved December 24, 2012. "(a) REQUIREMENT FOR SECRETARY OF INTERIOR TO TRANSFER CERTAIN SECTION 29 LANDS.—(1) Subject to paragraph (2), the Secretary of the Interior shall transfer to the Secretary of the Army administrative jurisdiction over the following lands located in section 29 of the National Park System at Arlington National Cemetery, Virginia: (A) The lands known as the Arlington National Cemetery Interment Zone. (B) All lands in the Robert E. Lee Memorial Preservation Zone, other than those lands in the Preservation Zone that the Secretary of the Interior determines must be retained because of the historical significance of such lands or for the maintenance of nearby lands or facilities." ^ a b Williams, Rudi, American Forces Press Service (May 27, 2005). "Arlington National Cemetery Gains 70 Acres of Land". United States Department of Defense. Archived from the original on March 1, 2010. https://web.archive.org/web/20100301004218/http://www.defense.gov/news/newsarticle.aspx?id=31562. Retrieved December 29, 2012. ^ a b c d e "Division B: Military Construction Authorization Act for Fiscal Year 2002: Title XXVIII—General Provisions: Subtitle E—Other Matters: Section 2863(h): Alternate Site for United States Air Force Memorial, Preservation of Open Space on Arlington Ridge Tract, and Related Land Transfer At Arlington National Cemetery, Virginia: Land Transfer, Section 29 (115 Stat. 1332–1333)" (pdf). Public Law 107-107: National Defense Authorization Act for Fiscal Year 2002. United States Government Printing Office. December 28, 2001. http://www.gpo.gov/fdsys/pkg/PLAW-107publ107/pdf/PLAW-107publ107.pdf. Retrieved March 16, 2013. "SEC. 2863. ALTERNATE SITE FOR UNITED STATES AIR FORCE MEMORIAL, PRESERVATION OF OPEN SPACE ON ARLINGTON RIDGE TRACT, AND RELATED LAND TRANSFER AT ARLINGTON NATIONAL CEMETERY, VIRGINIA..... (h) Land Transfer, Section 29.—(1) Transfer required.—Not later than 30 days after the date of the enactment of this Act, the Secretary of the Interior shall transfer, without reimbursement, to the Secretary of the Army administrative jurisdiction over that portion of Section 29 designated as the interment zone and consisting of approximately 12 acres. The Secretary of the Interior shall modify the boundaries of the George Washington Memorial Parkway as may be necessary to reflect the land transfer required by this subsection. (2) Use of transferred land.—The Secretary of the Army shall use the transferred property for the development of in-ground burial sites and columbarium that are designed to meet the contours of Section 29. (3) Management of remainder.—The Secretary of the Interior shall manage that portion of Section 29 not transferred under this subsection in perpetuity to provide a natural setting and visual buffer for Arlington House, the Robert E. Lee Memorial. (4) Repeal of obsolete law.—Section 2821(a) of the Military Construction Authorization Act for Fiscal Year 1997 (division B of Public Law 104-201; 110 Stat. 2791) is repealed." ^ a b Vogel, Steve (October 8, 1999). "Arlington Cemetery Gains Land to Expand". Metro (The Washington Post): p. B1. https://pqasb.pqarchiver.com/washingtonpost/doc/408547919.html. Retrieved December 31, 2012. (2) ... (c) Remediation of Land for Cemetery Use.—Immediately after the transfer of administrative jurisdiction over the Navy Annex property, the Secretary of Defense shall provide for the removal of any improvements on that property and shall prepare the property for use as part of Arlington National Cemetery. ..."
^ "Division B: Military Construction Authorization Act for Fiscal Year 2000: Title XVIII—General Provisions: Subtitle F—Expansion of Arlington National Cemetery: Section 2882. Transfer from Fort Myer, Arlington, Virginia (113 Stat. 880)" (pdf). Public Law 106-65: National Defense Authorization Act for Fiscal Year 2000. United States Government Printing Office. October 5, 1999. Archived from the original on January 2, 2013. http://www.gpo.gov/fdsys/pkg/PLAW-106publ65/pdf/PLAW-106publ65.pdf. Retrieved March 20, 2013. "SEC. 2882. TRANSFER FROM FORT MYER, ARLINGTON, VIRGINIA. (a) Land Transfer Required.—The Secretary of the Army shall modify the boundaries of Arlington National Cemetery and of Fort Myer to include in Arlington National Cemetery the following parcels of real property situated in Fort Myer, Arlington, Virginia: (1) A parcel comprising approximately five acres bounded by the Fort Myer Post Traditional Chapel to the southwest, McNair Road to the northwest, the Vehicle Maintenance Complex to the northeast, and the masonry wall of Arlington National Cemetery to the southeast. (2) A parcel comprising approximately three acres bounded by the Vehicle Maintenance Complex to the southwest, Jackson Avenue to the northwest, the water pumping station to the northeast, and the masonry wall of Arlington National Cemetery to the southeast." ^ "Division B: Military Construction Authorization Act for Fiscal Year 2005: Title XXVIII—General Provisions: Subtitle D—Land Conveyances: Part IV — Other Conveyances: Section 2881. Land Exchange, Arlington County, Virginia (118 Stat. 2153–2154)" (pdf). Public Law 108-375: Ronald W. Reagan National Defense Authorization Act for Fiscal Year 2005. United States Government Printing Office. October 28, 2004. http://www.dod.gov/dodgc/olc/docs/PL108-375.pdf. Retrieved March 20, 2013. "SEC. 2881. LAND EXCHANGE, ARLINGTON COUNTY, VIRGINIA. (a) Exchange Authorized.--The Secretary of Defense may convey to Arlington County, Virginia (in this section referred to as the "County"), all right, title, and interest of the United States in and to a parcel of real property, together with any improvements thereon, that consists of not more than 4.5 acres and is located north of Columbia Pike on the Navy Annex property in Arlington County, Virginia, for the purpose of the construction of a freedmen heritage museum and an Arlington history museum. (b) Consideration.—As consideration for the conveyance of the real property under subsection (a), the County shall convey to the United States all right, title, and interest of the County in and to a parcel of real property, together with any improvements thereon, that is of a size equivalent to the total acreage of the real property conveyed by the Secretary under subsection (a) and is located in the area known as the Southgate Road right-of-way between Arlington National Cemetery, Virginia, and the Navy Annex property..... (g) Inclusion of Southgate Road Right-of-Way Property in Transfer of Navy Annex Property for Arlington National Cemetery.—Subsection (a) of section 2881 of the Military Construction Authorization Act for Fiscal Year 2000 (division B of Public Law 106-65; 113 Stat. 879) is amended by striking "three parcels of real property consisting of approximately 36 acres" and inserting "four parcels of real property consisting of approximately 40 acres." ^ a b c Ruane, Michael E. (October 7, 2007). "For Warriors Past and Future". The Washington Post. Archived from the original on March 20, 2013. https://www.webcitation.org/6FGcJE3P0?url=http://www.washingtonpost.com/wp-dyn/content/article/2007/10/06/AR2007100601090.html. Retrieved December 31, 2012. "The Millennium expansion has involved, among other things, the sensitive transfer of 12 acres within the cemetery from the National Park Service's historic Arlington House, the onetime home of Robert E. Lee. The Park Service has lamented the likely loss of woodland and the cemetery's encroachment on the majestic hilltop home, which dates to 1802. 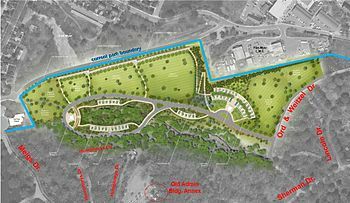 The project, which focuses on the northwest edge of the cemetery, includes expansion into about 10 acres taken from the Army's adjacent Fort Myer and four acres of cemetery maintenance property inside the boundaries, officials said. The extra space would provide room for 14,000 ground burials and 22,000 inurnments in a large columbarium complex, officials said. The project comes on the heels of extensive work underway to utilize 40 acres of unused space in the cemetery, creating room for 26,000 more graves and 5,000 inurnments. And there are plans for further outside expansion in the years ahead." ^ a b Sherman, Jerome L. (November 4, 2007). "More space for fallen heroes at Arlington". Pittsburgh Post-Gazette. Archived from the original on March 20, 2013. https://www.webcitation.org/6FGZgZwRo?url=http://www.post-gazette.com/stories/news/us/more-space-for-fallen-heroes-at-arlington-509186/. Retrieved March 20, 2013. ^ a b (1) Gearan, Anne (July 3, 1995). "Admirers of Lee Upset by Cemetery Expansion Plan". News Archive (Associated Press). Archived from the original on March 20, 2013. https://www.webcitation.org/6FGazXPlk?url=http://www.apnewsarchive.com/1995/Admirers-of-Lee-Upset-by-Cemetery-Expansion-Plan/id-b78a3bec5a330321f3d5d5d5da7259a6. Retrieved March 20, 2013. (2) Nakashima, Ellen (July 6, 1995). "Environmentalists Fear Effects of Expanded Arlington Cemetery". Metro (The Washington Post): p. B3. https://pqasb.pqarchiver.com/washingtonpost/access/6855447.html?FMT=ABS&FMTS=ABS&date=Jul+6%2C+1995&author=Nakashima%2C+Ellen&pub=The+Washington+Post&edition=&startpage=B3&desc=Environmentalists+fear+effects+of+expanded+Arlington+cemetery. Retrieved December 29, 2012. ^ a b "Division E—Military Construction and Veterans Affairs, and Related Agencies Appropriations Act, 2013: Title III: Related Agencies: Department of Defense—Civil: Cemeterial Expenses, Army: Construction". Public Law 113-6: Consolidated and Further Continuing Appropriations Act, 2013 (127 STAT. 198). Washington, D.C.: United States Government Printing Office. March 26, 2013. p. 127 STAT. 409. http://www.gpo.gov/fdsys/pkg/PLAW-113publ6/pdf/PLAW-113publ6.pdf. Retrieved July 18, 2013. "For necessary expenses for planning and design and construction at Arlington National Cemetery and Soldiers' and Airmen's Home National Cemetery, $103,000,000, to remain available until September 30, 2017, of which, $84,000,000 shall be for planning and design and construction associated with the Millennium Project at Arlington National Cemetery; and $19,000,000 shall be for study, planning, design, and architect and engineer services for future expansion of burial space at Arlington National Cemetery." ^ Vogel, Steve (August 11, 1998). "Arlington Cemetery Proposal Put on Hold; Officials Say Plan to Transfer Land From Navy Annex, Fort Myer Needs Review". The Washington Post: p. B3. Archived from the original on 30 July 2014. https://web.archive.org/web/20140730013211/http://pqasb.pqarchiver.com/washingtonpost/doc/408384852.html. Retrieved July 29, 2014. "A congressional proposal to expand Arlington National Cemetery onto land now occupied by the Navy Annex and Fort Myer has been at least temporarily put on hold, but officials predicted that in the long term, at least some of the property may be turned into grave sites. (Bob) Stump's proposal, attached to a bill that cleared the House earlier this summer, would have transferred 36.5 acres from the Navy Annex and eight acres from Fort Myer to Arlington Cemetery. The move would create sufficient burial sites to last until 2040, officials said. The proposal has sparked anxiety in Arlington County, where community leaders complained that they had not been consulted about such a major decision." ^ (January 15, 2013) "Title 10: Subtitle B: Part IV: Chapter 446—Army National Military Cemeteries". United States Code: 2011–2012. Retrieved on July 19, 2017. ^ (1) Donnellen, Barbara M., County Manager, Arlington County, Virginia; Condon, Kathryn A., Executive Director, Army National Military Cemeteries (January 10, 2013). "Memorandum of Understanding Between Department of the Army and County Board of Arlington County, Virginia". Arlington County government. Archived from the original on July 19, 2017. https://web.archive.org/web/20170719205544/https://arlingtonva.s3.amazonaws.com/wp-content/uploads/sites/31/2015/08/Arlington_County_and_ANC_MOU-Signed.pdf. Retrieved July 19, 2017. (2) "County Reaches Agreement With Army Over Arlington Nat'l Cemetery Expansion". ARLnow.com. January 10, 2013. Archived from the original on July 18, 2017. https://web.archive.org/web/20170718210221/http://www.arlnow.com/2013/01/10/county-reaches-agreement-with-army-over-arlington-natl-cemetery-expansion/. Retrieved February 4, 2013. (B) from the Commonwealth of Virginia (in this section referred to as the "Commonwealth"), one or more parcels of property in the area known as the Columbia Pike right-of-way, including the Washington Boulevard-Columbia Pike interchange, but excluding the Virginia Department of Transportation Maintenance and Operations Facility. ...."
^ (1) "Army Opts Out of Land Exchange with Arlington County". News Release. Arlington County, Virginia, government. June 15, 2017. Archived from the original on July 19, 2017. https://web.archive.org/web/20170719205738/https://newsroom.arlingtonva.us/release/army-opts-out-of-land-exchange-with-arlington-county/. Retrieved July 18, 2017. (2) "Arlington Cemetery Southern Expansion and Roadway Realignment Project". Projects & Planning. Arlington County government. Archived from the original on July 19, 2017. https://web.archive.org/web/20170719210917/https://projects.arlingtonva.us/projects/arlington-cemetery-southern-expansion/. Retrieved July 18, 2017. (3) Sullivan, Patricia (June 16, 2016). "Army, county break off land swap talks over Arlington Cemetery expansion". Virginia (The Washington Post). Archived from the original on July 19, 2017. https://web.archive.org/web/20170719205935/https://www.washingtonpost.com/local/virginia-politics/army-county-break-off-land-swap-talks-over-arlington-cemetery-expansion/2017/06/16/20e8372c-52a8-11e7-be25-3a519335381c_story.html?utm_term=.14f54f29582a. Retrieved July 18, 2017. ^ (1) "Interactive map of Arlington National Cemetery showing Section 29 and Future Expansion Site". Arlington National Cemetery. Archived from the original on April 18, 2015. https://web.archive.org/web/20150418081700/http://public.mapper.army.mil/ANC/ANCWeb/PublicWMV/ancWeb.html. Retrieved December 26, 2012. ^ a b Hanna, Jennifer (October 2001). "Arlington House: The Robert E. Lee Memorial: Cultural Landscape Report: History" (pdf) 1. Retrieved on December 24, 2012. ^ Nakashima, Ellen (July 6, 1995). "Environmentalists Fear Effects of Expanded Arlington Cemetery". The Washington Post: p. B3. ^ ""The Arlington Woodlands: Arlington House, The Robert E. Lee Memorial" marker". The Historical Marker Database. September 25, 2008. Archived from the original on February 9, 2014. http://www.hmdb.org/marker.asp?marker=11750. Retrieved February 9, 2014. ^ a b c d e f Calhoun, Audrey F., Superintendent, National Capital Region, National Park Service, United States Department of the Interior (July 12, 1999). "Notice: Environmental Assessment of Proposed Land Transfer, Arlington House — The Robert E. Lee Memorial, George Washington Memorial Parkway to Department of the Army, Arlington National Cemetery" (pdf). Federal Register 64: 37564–37565. Retrieved on December 24, 2012. ^ "Public Notice: NAO-121207-Millennium: Environmental assessment for expansion of Arlington National Cemetery, known as the Millennium Project)". Norfolk District Media & Public Affairs. United States Army Corps of Engineers. December 7, 2012. Archived from the original on December 25, 2012. https://www.webcitation.org/6DAEDIFhV?url=http://www.nao.usace.army.mil/Media/PublicNotices/tabid/3060/Article/7037/nao-121207-millennium.aspx. Retrieved December 24, 2012. ^ Standifer, Cid (December 20, 2012). "Cemetery Plan Would Remove Old Growth Trees". Arlington Mercury. http://arlingtonmercury.org/countywide/cemetery-plan/. ^ Holland, Taylor (December 21, 2012). "Arlington cemetery expansion threatens 890 trees". The Washington Examiner. http://washingtonexaminer.com/arlington-cemetery-expansion-threatens-890-trees/article/2516666. ^ a b United States Army Corps of Engineers (December 2012). "Arlington National Cemetery Millennium Project Environmental Assessment" (pdf): 12, 35, 40, 53–59, 78, 97. Retrieved on December 24, 2012. ^ "Millennium Project Revised Environmental Assessment". Norfolk, Virginia: United States Army Corps of Engineers Norfolk District. March 12, 2013. Archived from the original on March 12, 2013. http://www.nao.usace.army.mil/Media/PublicNotices/tabid/3060/Article/11394/millennium-project-revised-environmental-assessment.aspx. Retrieved March 12, 2013. ^ (1) Holland, Taylor (March 14, 2013). "Arlington Cemetery would spare just 8 of nearly 900 trees in expansion". Washington, D.C.: The Washington Examiner. Archived from the original on March 15, 2013. https://www.webcitation.org/6F965pgMG?url=http://washingtonexaminer.com/article/2524411. Retrieved March 15, 2013. (2) Svrluga, Susan (May 4, 2013). "Arlington National Cemetery plans expansion to take it into 2050s". Post Local. The Washington Post. Archived from the original on July 19, 2013. https://www.washingtonpost.com/local/arlington-national-cemetery-plans-expansions/2013/05/04/74cf3494-a37f-11e2-82bc-511538ae90a4_story.html. Retrieved July 18, 2013. ^ "Appendix F: Comments to Draft Millennium EA: Public Comment Period: 6 December 2012 to 21 January 2013". Archived from the original on August 1, 2013. https://web.archive.org/web/20130801064224/http://www.nao.usace.army.mil/Portals/31/docs/Arlington/RevisedMillenniumEA_March2013AppendixFCommentstoDraftEA.pdf. Retrieved March 12, 2013. in Arlington National Cemetery Millennium Project Environmental Assessment, March 2013, pp. 222–328. ^ Irons, Elie L., Program Manager, Environmental Impact Review (January 10, 2013). "Forest Resources". Letter to Ms. Susan L. Conner, U.S. Army Corps of Engineers, Norfolk District re. Arlington National Cemetery Millennium Project: Federal Consistency Determination (DEQ-12-203F) and Environmental Assessment (DEQ-12-225F). Richmond, Virginia: Commonwealth of Virginia Department of Environmental Quality. p. 15. Archived from the original on August 1, 2013. https://web.archive.org/web/20130801064224/http://www.nao.usace.army.mil/Portals/31/docs/Arlington/RevisedMillenniumEA_March2013AppendixFCommentstoDraftEA.pdf. Retrieved March 12, 2013. in Arlington National Cemetery Millennium Project Environmental Assessment, March 2013, (Appendix F: Comments to Draft Millennium EA:Public Comment Period: December 6, 2012 to January 21, 2013), p. 259. ^ (1) "Impacts to Trees" (pdf). Arlington National Cemetery Millennium Project Environmental Assessment. Norfolk, Virginia: United States Army Corps of Engineers Norfolk District. March 2013. pp. 43–45, 147. Archived from the original on March 12, 2013. https://www.webcitation.org/6F4euQ2LA?url=http://www.nao.usace.army.mil/Portals/31/docs/Arlington/RevisedMillenniumEA_March2013.pdf. Retrieved March 12, 2013. (2) "Draft Finding of No Significant Impact Millennium Project, Arlington National Cemetery, Arlington, Virginia". Norfolk, Virginia: United States Army Corps of Engineers Norfolk District. March 8, 2013. Archived from the original on April 10, 2013. http://www.nao.usace.army.mil/Portals/31/docs/Arlington/Millennium_draftFONSI_march8.pdf. Retrieved April 10, 2013. ^ a b (1) (pdf) Arlington National Cemetery Millennium Project Final Environmental Assessment. Norfolk, Virginia: United States Army Corps of Engineers Norfolk District. June 2013. Archived from the original on July 17, 2013. https://www.webcitation.org/6IBfCPb51?url=http://www.nao.usace.army.mil/Portals/31/siteimages/milcon/Arlington/MillenniumEAJune2013.pdf. Retrieved July 17, 2013. (2) Federoff, David (June 5, 2013). "Finding of No Significant Impact Millennium Project, Arlington National Cemetery, Arlington, Virginia" (pdf). Retrieved on July 16, 2013. ^ (1) "Appendix J: Comments on Revised Millennium EA: Public Comment Period 12 March 2013 to 12 April 2013". Arlington National Cemetery Millennium Project Final Environmental Assessment, June 2013. Archived from the original on July 17, 2013. http://www.nao.usace.army.mil/Portals/31/siteimages/milcon/Arlington/MillenniumEAJune2013AppendixJCommentsonRevisedEA.pdf. Retrieved July 17, 2013. (2) Sullivan, Patricia (June 12, 2012). "Army Corps says go ahead with Arlington cemetery expansion". Post Local (The Washington Post). Archived from the original on July 18, 2013. https://www.webcitation.org/6ID0cRtKF?url=http://www.washingtonpost.com/local/army-corps-says-go-ahead-with-arlington-cemetery-expansion/2013/06/11/2ba28d7e-d1d4-11e2-a73e-826d299ff459_story.html. Retrieved July 18, 2013. ^ a b c d "Impacts to Trees" (pdf). Arlington National Cemetery Millennium Project Final Environmental Assessment. Norfolk, Virginia: United States Army Corps of Engineers Norfolk District. June 2013. pp. 114–115. Archived from the original on July 17, 2013. https://www.webcitation.org/6IBfCPb51?url=http://www.nao.usace.army.mil/Portals/31/siteimages/milcon/Arlington/MillenniumEAJune2013.pdf. Retrieved July 17, 2013. ^ Tree Tag #1026 (Black Cherry, Prunus serotina). Archived from the original on July 17, 2013. https://www.webcitation.org/6IBc36lMw?url=http://www.nao.usace.army.mil/Portals/31/siteimages/milcon/Arlington/MillenniumEAJune2013AppendixITreeInventoryandAnalysis.pdf. in Arlington National Cemetery Millennium Project Final Environmental Assessment, June 2013, Appendix I (Tree Inventory and Analysis), p. 13. ^ (1) (pdf) Figure A: Millennium Project with Tree Ages and NPS Property. Norfolk, Virginia: United States Army Corps of Engineers Norfolk District. June 2013. p. 4. Archived from the original on July 17, 2013. https://www.webcitation.org/6IBfCPb51?url=http://www.nao.usace.army.mil/Portals/31/siteimages/milcon/Arlington/MillenniumEAJune2013.pdf. Retrieved July 17, 2013. (2) (pdf) Figure 38: Existing conditions, impacts, and contributing areas of Arlington House: Historic Landscape Effects: ANC Boundary Wall and Arlington House Forest. Norfolk, Virginia: United States Army Corps of Engineers Norfolk District. June 2013. p. 133. Archived from the original on July 17, 2013. https://www.webcitation.org/6IBfCPb51?url=http://www.nao.usace.army.mil/Portals/31/siteimages/milcon/Arlington/MillenniumEAJune2013.pdf. Retrieved July 17, 2013. (3) Seagraves, Anna; Fuqua, Ann; Veloz, Nicholas, George Washington Memorial Parkway, National Capital Region, National Park Service (January 15, 1980). "Arlington House, The Robert E. Lee Memorial". United States Department of the Interior: National Park Service: National Register of Historic Places — Nomination Form for Federal Properties. Richmond, Virginia: Virginia Department of Historic Resources. p. 8. Archived from the original on July 17, 2013. http://www.dhr.virginia.gov/registers/Counties/Arlington/000-0001_Arlington_House_1966_Final_Nomination.pdf. Retrieved July 17, 2013. ^ (1) Young, Deborah B. (July 11, 2013). "Commission Action: Millennium Project, Arlington National Cemetery, Arlington, VA (NCPC File Number 7457)" (pdf). Retrieved on July 16, 2013. (2) (July 11, 2013) "Executive Director's Recommendation: Commission Meeting: July 11, 2013: Millennium Project, Arlington National Cemetery, Arlington, VA (NCPC File Number 7457)" (pdf). Retrieved on July 16, 2013. ^ a b Julian E. Barnes (June 11, 2010). "Arlington National Cemetery's top supervisors ousted in mismanagement case". Los Angeles Times (LATimes.com). Archived from the original on January 11, 2012. https://web.archive.org/web/20120111122056/http://articles.latimes.com/2010/jun/11/nation/la-na-arlington-cemetery-20100611. Retrieved July 29, 2011. ^ William H. McMichael (June 10, 2010). "Errors at Arlington affected 211 graves". Military Times (armytimes.com). http://www.armytimes.com/news/2010/06/military_arlington_cemetery_061010w. Retrieved July 29, 2011. ^ Associated Press (June 9, 2010). "Arlington Cemetery superintendent retiring". Army Times. http://www.armytimes.com/news/2010/06/ap_arlington_cemetery_060910w. Retrieved July 29, 2011. ^ Aaron C. Davis (July 14, 2010). "Arlington Cemetery's Deputy Chief Retires Amid Investigation". Washington Post (WashingtonPost.com): p. B1. Archived from the original on January 31, 2011. https://web.archive.org/web/20110131133446/http://www.washingtonpost.com/wp-dyn/content/article/2010/07/13/AR2010071306344.html. Retrieved July 29, 2011. ^ Christian Davenport (March 7, 2011). "For first time in decades, Arlington National Cemetery must bury multiple 'unknowns'". Washington Post (Washingtonpost.com): p. 1. Archived from the original on June 2, 2012. https://web.archive.org/web/20120602081704/http://www.washingtonpost.com/wp-dyn/content/article/2011/03/06/AR2011030603633.html. Retrieved July 29, 2011. ^ Dana Milbank (July 10, 2008). "Putting Her Foot Down And Getting The Boot". Washington Post (WashingtonPost.com): p. 3. Archived from the original on June 29, 2011. https://web.archive.org/web/20110629034316/http://www.washingtonpost.com/wp-dyn/content/article/2008/07/09/AR2008070902169.html. Retrieved July 29, 2011. ^ "Army names new superintendent for Arlington National Cemetery". Army News Service. October 20, 2010. Archived from the original on September 5, 2015. https://web.archive.org/web/20150905232014/http://www.army.mil/article/46846/. Retrieved August 21, 2015. ^ a b "Lechner Named Superintendent of Arlington National Cemetery". Memorial Business Journal. May 29, 2014. http://nfda.org/government-relations-/current-funeral-service-issues/3974-lechner-named-superintendent-of-arlington-national-cemetery.html. Retrieved August 21, 2015. ^ Davenport, Christian (August 21, 2015). "Arlington National Cemetery superintendent removed". Local (The Washington Post). https://www.washingtonpost.com/local/arlington-national-cemetery-superintendent-removed/2015/08/21/661baa32-4831-11e5-8e7d-9c033e6745d8_story.html. Retrieved July 21, 2017. ^ a b c d "Our Story". Columbia Falls, Maine: Wreaths Across America. Archived from the original on September 29, 2016. https://web.archive.org/web/20160929190951/http://www.wreathsacrossamerica.org/our-story/. Retrieved September 29, 2016. ^ Leipold, J.D. (December 15, 2006). "Veterans' Cemeteries Across America Receive Wreaths". United States Army. Archived from the original on June 17, 2016. http://www.army.mil/article/1007/. Retrieved September 29, 2016. ^ writer, LINDA CARMICHAEL Contributing. "Wreaths Across America in planning stages" (in en). Tehachapi News. Archived from the original on April 7, 2017. https://web.archive.org/web/20170407233143/http://www.tehachapinews.com/lifestyle/wreaths-across-america-in-planning-stages/article_15db95c2-04e7-11e7-a05b-67bc55c7808e.html. ^ Phillips, Michael M. (December 21, 2015). "Wreaths Across America Has Family-Ties To Its Supplier". Wall Street Journal. Archived from the original on July 11, 2017. https://web.archive.org/web/20170711201407/https://www.wsj.com/articles/wreaths-across-america-has-family-ties-to-its-supplier-1450740374. Retrieved January 27, 2017. ^ "Arlington National Cemetery 150th Anniversary Commemoration, May 13, 2014 to June 16, 2014". Arlington, Virginia: Arlington National Cemetery: United States Army. Archived from the original on December 4, 2015. https://web.archive.org/web/20151204182330/http://www.arlingtoncemetery.mil/Explore/History/ANC-150th-Anniversary. Retrieved September 29, 2016. ^ Ruane, Michael E. (May 16, 2014). "Arlington Cemetery to Rename Old Ampitheater for Civil War Double Amputee James Tanner". The Washington Post. Archived from the original on June 7, 2014. https://web.archive.org/web/20140607125420/http://www.washingtonpost.com/local/arlington-cemetery-to-rename-old-ampitheater-for-civil-war-double-amputee-james-tanner/2014/05/16/7c85add4-dd3b-11e3-bda1-9b46b2066796_story.html. Retrieved May 29, 2014. ^ "Interactive map of Arlington National Cemetery". Arlington National Cemetery. Archived from the original on April 18, 2015. https://web.archive.org/web/20150418081700/http://public.mapper.army.mil/ANC/ANCWeb/PublicWMV/ancWeb.html. Retrieved January 20, 2013. ^ "Mementos adorn 'saddest acre'". CNN. May 23, 2009. Archived from the original on August 8, 2009. https://web.archive.org/web/20090808120943/http://edition.cnn.com/2009/US/05/23/section.60.cemetery/index.html. Retrieved August 5, 2009. ^ "Nurses Memorial". Arlington National Cemetery. http://www.arlingtoncemetery.org/text/nurses_memorial_text.html. Retrieved August 5, 2009. ^ "Confederate Memorial". Arlington National Cemetery. Archived from the original on July 25, 2009. https://web.archive.org/web/20090725141115/http://www.arlingtoncemetery.org/visitor_information/Confederate_Memorial.html. Retrieved August 5, 2009. ^ "History of Government Furnished Headstones and Markers". Department of Veterans Affairs. February 1, 2010. Archived from the original on October 22, 2011. https://web.archive.org/web/20111022005906/http://www.cem.va.gov/hist/hmhist.asp. Retrieved July 29, 2011. ^ a b "Arlington National Cemetery Facts". Arlington National Cemetery. Archived from the original on August 19, 2010. https://web.archive.org/web/20100819092926/http://www.arlingtoncemetery.org/visitor_information/anc_facts.html. Retrieved July 29, 2011. ^ "Ordering a Headstone or Marker". Department of Veterans Affairs. Archived from the original on June 28, 2011. https://web.archive.org/web/20110628222655/http://www.cem.va.gov/hm/hmorder.asp. Retrieved July 29, 2011. ^ "Application for Standard Government Headstone or Marker for Installation Cemetery or State Veterans' Cemetery". Department of Veterans Affairs. August 2009. Archived from the original on July 28, 2011. http://www.va.gov/vaforms/va/pdf/VA40-1330.pdf. Retrieved July 29, 2011. ^ "Available Emblems of Belief for Placement on Government Headstones and Markers". Department of Veterans Affairs. May 16, 2011. http://www.cem.va.gov/hmm/emblems.asp. Retrieved May 28, 2013. ^ "Veterans Denied Right to Post Religious Symbol on Headstones, ACLU Charges" (Press release). American Civil Liberties Union. September 29, 2006. Archived from the original on July 23, 2011. https://www.aclu.org/religion-belief/veterans-denied-right-post-religious-symbol-headstones-aclu-charges. Retrieved July 29, 2011. ^ Associated Press (April 23, 2007). "Wiccans symbols allowed on grave markers in government cemeteries". International Herald Tribune. Archived from the original on June 27, 2007. https://web.archive.org/web/20070627115226/http://www.iht.com/articles/ap/2007/04/23/america/NA-GEN-US-Wiccan-Soldier.php. Retrieved July 11, 2007. ^ "Veterans Affairs Department Must Accommodate Wiccan Symbol On Memorial Markers At Government Cemeteries, Says Americans United" (Press release). Americans United (AU.org). June 8, 2006. Archived from the original on October 8, 2007. http://www.au.org/site/News2?JServSessionIdr003=bg8nm5s6e1.app13a&abbr=pr&page=NewsArticle&id=8269&security=1002&news_iv_ctrl=1241. Retrieved July 11, 2007. ^ "Available Emblems of Belief for Placement on Government Headstones and Markers". VA.gov. Archived from the original on July 11, 2007. https://web.archive.org/web/20070711063328/http://www.cem.va.gov/cem/hm/hmemb.asp. Retrieved July 11, 2007. ^ "Private Headstone Markers". Arlington National Cemetery. Archived from the original on January 4, 2014. https://web.archive.org/web/20140104212606/http://www.arlingtoncemetery.mil/funeralinformation/OrderHeadstone.aspx. Retrieved March 3, 2012. ^ "The Memorial Amphitheater at Arlington National Cemetery". Arlingtoncemetery.org. Arlington National Cemetery. Archived from the original on July 6, 2010. http://www.arlingtoncemetery.org/visitor_information/amphitheater.html. Retrieved July 29, 2011. ^ Poole, Robert M. (2010). On hallowed ground : the story of Arlington National Cemetery. New York: Bloomsbury Publishing USA. ISBN 9780802715494. https://books.google.com/books?id=ec-mCAAAQBAJ. Retrieved July 20, 2016. ^ "Old Amphitheatre". Arlington National Cemetery. Archived from the original on June 19, 2010. http://www.arlingtoncemetery.org/visitor_information/old_amphitheater.html. Retrieved July 29, 2011. ^ "The Changing of the Guard". Arlington, Virginia: Arlington National Cemetery. Archived from the original on January 22, 2013. https://www.webcitation.org/6Dqy6Z5HJ?url=http://www.arlingtoncemetery.mil/VisitorInformation/ChangingofTheGuard.aspx. Retrieved January 21, 2012. ^ Juell, Rod. 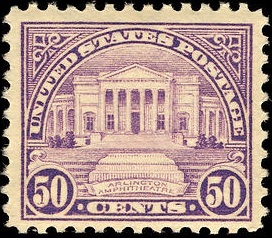 "50-cent Arlington Amphitheater", Arago: people, postage & the post, National Postal Museum online, viewed March 12, 2014. ^ "Columbia Memorial Dedicated at Arlington". NASA. Archived from the original on September 18, 2011. http://www.nasa.gov/columbia/home/F_04_Memorials.html. Retrieved July 29, 2011. ^ Jim Garamone (September 12, 2002). "Remains of Pentagon Attack Victims Buried at Arlington". American Forces Press Service (Department of Defense). http://www.defense.gov/news/newsarticle.aspx?id=43465. Retrieved July 27, 2011. ^ "Fast Track: 'Place of Remembrance' Planned for Arlington." Navy Times. June 25, 2012. ^ "Wikimapia – Let's describe the whole world!". Archived from the original on September 27, 2009. http://wikimapia.org/#y=38881187&x=-77072128&z=17&l=0&m=h&v=2. ^ "32 CFR 553.15a—Persons eligible for inurnment of cremated remains in Columbarium in Arlington National Cemetery". National Archives and Records Administration. July 27, 2011. http://ecfr.gpoaccess.gov/cgi/t/text/text-idx?c=ecfr;rgn=div8;view=text;node=32%3A3.1.1.4.18.0.11.16;idno=32;cc=ecfr;sid=1b5d76eb98eb266e4144e384e69e930a. Retrieved July 29, 2011. ^ "Establishing Eligibility—Eligibility for Interment (Ground Burial)". Arlington National Cemetery. Archived from the original on September 1, 2010. http://www.arlingtoncemetery.org/funeral_information/guide.interment.html. Retrieved July 29, 2011. ^ Associated Press (August 10, 2005). "Arlington National Cemetery Burial Law Eyed". Fox News. http://www.foxnews.com/story/0,2933,165335,00.html. Retrieved July 29, 2011. ^ "Arlington National Cemetery Section 27 facts". Arlington National Cemetery. Archived from the original on March 14, 2009. http://www.arlingtoncemetery.org/historical_information/section_27_facts.html. Retrieved April 25, 2009. ^ "Medal of Honor Walking Tour". U.S. Army. Archived from the original on December 24, 2016. http://www.arlingtoncemetery.mil/portals/0/Docs/NewsReleases/Medal%20of%20Honor%20Walking%20Tour.pdf. Retrieved April 24, 2016. ^ Ruane, Michael E. (April 6, 2017). "Astronaut, senator, Marine: John Glenn is buried in Arlington Cemetery". Local (The Washington Post). https://www.washingtonpost.com/local/astronaut-senator-marine-john-glenn-is-buried-in-arlington-cemetery/2017/04/06/398a32dc-1ad9-11e7-9887-1a5314b56a08_story.html. Retrieved July 21, 2017. ^ "CWGC: John Dill". http://www.cwgc.org/find-war-dead/casualty/2720066/DILL,%20Sir%20JOHN%20GREER. ^ McLeroy, Carrie (June 2, 2014). "There's a lot you don't know about Arlington National Cemetery". United States Army. Archived from the original on June 15, 2014. http://soldiers.dodlive.mil/2014/06/theres-a-lot-you-dont-know-about-arlington-national-cemetery/. Retrieved June 23, 2014. "There are only two equestrian monuments at Arlington National Cemetery. The first is for Maj. Gen. Philip Kearney, located in Section 2. The second is Field Marshall Sir John Dill in Section 32." ^ "Bicycle Use Policy". Arlington, Virginia: Arlington National Cemetery, United States Army. Archived from the original on February 2, 2016. https://web.archive.org/web/20160202142650/http://www.arlingtoncemetery.mil/Visit/Getting-Here/Getting-Around/Bicycle-Use-Policy. Retrieved September 29, 2016. ^ a b c d e f g Hallinan, Patrick, Executive Director, Army National Military Cemeteries (August 6, 2013). "Memorandum For All Visitors to Arlington National Cemetery: Subject: Bicycle Use on Arlington National Cemetery". Arlington, Virginia: Arlington National Cemetery: Army National Military Cemeteries: Department of the Army. Archived from the original on September 29, 2016. https://www.webcitation.org/6ktUaUhnP?url=http://www.arlingtoncemetery.mil/Portals/0/Docs/ANC%20Bicycle%20Use%20Policy_Aug2013.pdf. Retrieved September 29, 2016. (2) Wentling, Nikki (October 18, 2016). "Arlington National Cemetery to impose bicycle ban". Stars and Stripes. Archived from the original on July 17, 2017. https://web.archive.org/web/20170717205551/https://www.stripes.com/news/arlington-national-cemetery-to-impose-bicycle-ban-1.434693#.WW0kjdyQy70. "Bicyclists will no longer be allowed to ride through the grounds of Arlington National Cemetery under a new policy that's set to start next week despite protest from local officials and bicycle groups. Bicyclists disrupt funeral services, affect other visitors' experiences and pose safety concerns, the Army said in an announcement of the new rule, which goes into effect Oct. 26. But the Arlington County Board and bicycle advocacy organizations in Arlington and nearby Fairfax County argued cyclists using the cemetery do so respectfully." ^ (1) "Bicycle Use Policy". Arlington, Virginia: Arlington National Cemetery, United States Army. October 26, 2016. Archived from the original on July 17, 2017. https://web.archive.org/web/20170717205926/http://www.arlingtoncemetery.mil/Visit/Getting-Here/Getting-Around/Bicycle-Use-Policy. Retrieved July 17, 2017. (2) Kelleher, Colleen (October 26, 2016). "Bikes, pets banned from Arlington National Cemetery". Arlington, VA News. WTOP. Archived from the original on July 17, 2017. https://web.archive.org/web/20170717210120/http://wtop.com/arlington/2016/10/bikes-pets-banned-from-arlington-national-cemetery/. Retrieved July 17, 2017. ^ (1) "Arlington National Cemetery Announces Enhanced Visitor Security Measures". United States Department of Defense. September 12, 2016. Archived from the original on September 13, 2016. https://web.archive.org/web/20160913170109/http://www.defense.gov/News/Article/Article/941736/arlington-national-cemetery-announces-enhanced-visitor-security-measures. Retrieved September 29, 2016. (2) St. Martin, Victoria (September 12, 2016). "Arlington National Cemetery increases security measures". Metro. The Washington Post. Archived from the original on October 2, 2016. https://www.washingtonpost.com/local/arlington-national-cemetery-increases-security-measures/2016/09/12/0ceb7448-7926-11e6-bd86-b7bbd53d2b5d_story.html. Retrieved September 29, 2016. Arlington National Cemetery Millennium Project Environmental Assessment. Norfolk, Virginia: United States Army Corps of Engineers Norfolk District. March 2013. Archived from the original on March 12, 2013. https://www.webcitation.org/6F4euQ2LA?url=http://www.nao.usace.army.mil/Portals/31/docs/Arlington/RevisedMillenniumEA_March2013.pdf. Retrieved March 12, 2013. Chase, Enoch Aquila. "The Arlington Case: George Washington Custis Lee against the United States of America." Records of the Columbia Historical Society. 31/32: 1930. Hanna, Jennifer (2001). Arlington House, The Robert E. Lee Memorial. Washington DC: National Capital Region, National Park Service, U. S. Department of the Interior. p. 62. https://www.nps.gov/parkhistory/online_books/arho/clr.pdf. Retrieved October 18, 2016. Dennee, Tim. "African-American Civilians Interred in Section 27 of Arlington National Cemetery, 1864–1867." Friends of Freedmen's Cemetery. FreedmensCemetery.org. 2012. Accessed 2012-07-09. Hansen, Harry. The Civil War: A History. New York: Signet, 2001. "Arlington National Cemetery home page". http://www.arlingtoncemetery.mil/#/. Retrieved September 30, 2016. "National Park Service site". Archived from the original on August 28, 2010. http://www.nps.gov/arho/. Retrieved March 11, 2010. "Arlington Cemetery: Hallowed Ground". Life magazine. Archived from the original on April 14, 2010. http://www.life.com/image/first/in-gallery/26692/arlington-cemetery-hallowed-ground. Retrieved March 11, 2010. This page uses content from the English language Wikipedia. The original content was at Arlington National Cemetery. The list of authors can be seen in the page history. As with this Familypedia wiki, the content of Wikipedia is available under the Creative Commons License.